0 Comments Published by KL Ocs Kid on Friday, August 17, 2007 at 3:18 PM. I'm sure he will continue to chop and change. 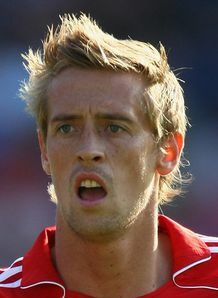 Liverpool striker Peter Crouch has denied he has fallen out with manager Rafa Benitez. The England international was a frustrated spectator last weekend, after being left out of The Reds' late win at Aston Villa. Crouch has admitted his disappointment at sitting out the season-opener and held talks with Benitez to clarify his position. The former Southampton ace played the full 90 minutes in Wednesday's win at Toulouse and the striker is determined to prove his worth to Benitez. "I was disappointed to miss out on Saturday, so it was good to play against Toulouse," he told the Liverpool Echo. "The manager explained to me it will be a long season, and he proved what he meant by replacing the two who started on Saturday with myself and Andrei (Voronin). "I'm sure he will continue to chop and change, but everyone will play their fair share. "Everyone knows players want to be playing every game, so when you are geared up all pre-season to play the first game against Aston Villa, of course you don't want to miss out. "Anyone who was in my position would feel the same. People would be more disappointed in me if I didn't feel disappointed not to play. "But what I will say is that whenever I'm called upon I'll be ready. I've got to prove to the manager when I get the chance that I should be in the team."